Heat oil. Add chopped ginger and garlic. Stir for few mins and add onion and green chillies. When they turn transluscent, add tomatoes and stir on high heat. When the mixture is almost dry, add rest of the ingredients and adjust salt.Stir fry for few mins.Sprinkle pepper powder. Let the mixture cool. Cut the lettuce into big chunks and use two or three layers as a basket. Spoon 2 tablespoon of chicken mixture and serve. 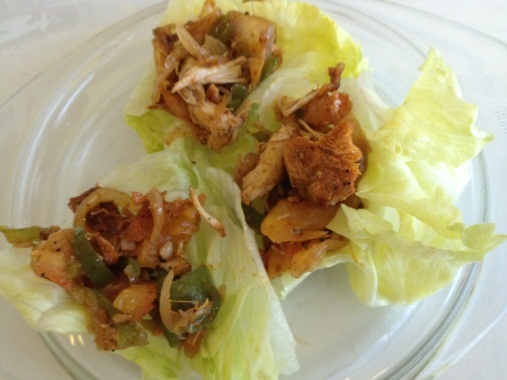 This entry was posted in Appetizer: Non-Veg and tagged appetizer, chicken, easy appetizer, lettuce, make ahead appetizer by PriyaBaby. Bookmark the permalink.